The service was crowded. An elder and de facto marriage counselor, Otto was beloved. She was the kind of person who cooked steaming plates of walrus for her community every January for Russian Orthodox Christmas – even though she wasn't Orthodox herself. After the viewing, Otto's pallbearers carried her casket outside, placed it on a metal cart, and attached it to the back of a four-wheeler. 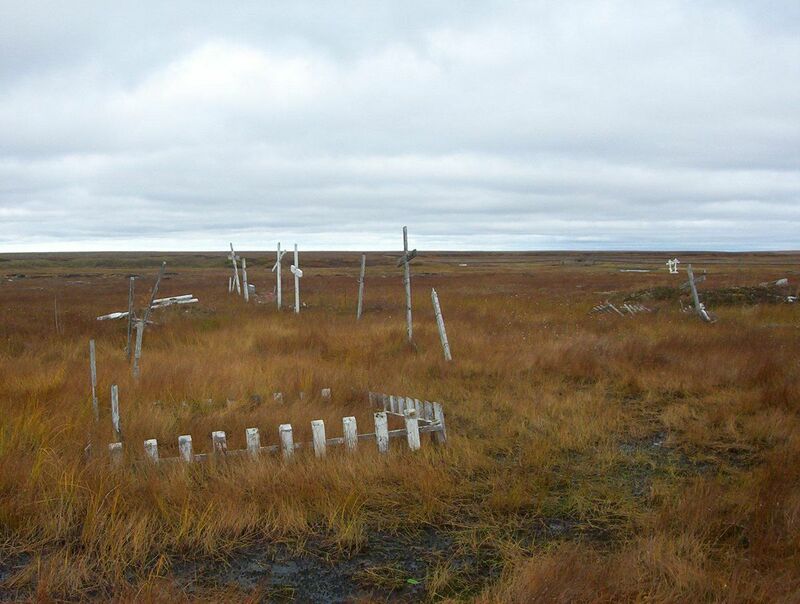 Kong's cemetery is a 10-minute drive on a boardwalk over marshy tundra. A procession of four-wheelers followed the casket to a rust-colored hill and a smattering of chalk-white crosses. Rather than lowering Otto's body into the ground, pallbearers placed her casket on a low wooden platform, raised about 6 inches above the ground on blocks. A half-dozen men lifted a white, wooden box and placed it over her casket to protect it from the elements, covering it completely. Climate change is thawing the Yukon-Kuskokwim Delta's permafrost, and it's doing more than cracking foundations, sinking roads and accelerating erosion. 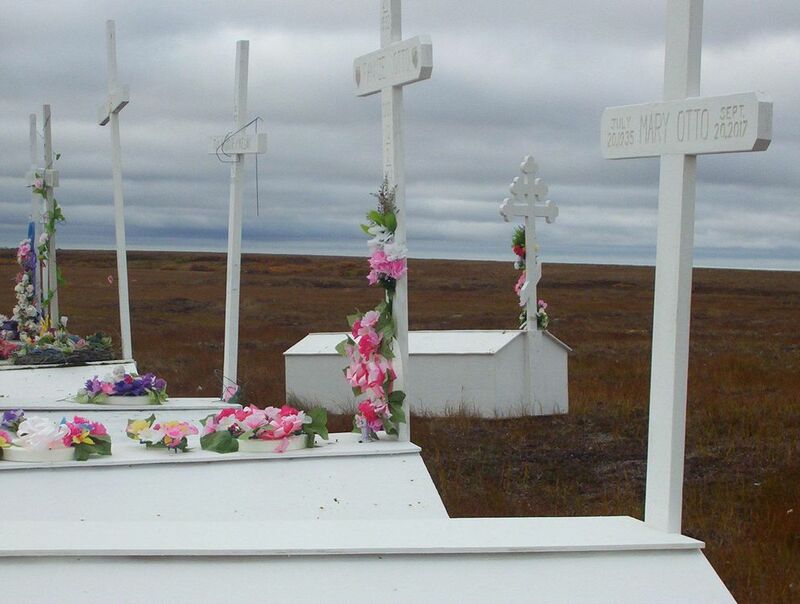 In villages like Kong, communities have stopped burying their dead because, as the permafrost melts, the oldest part of their cemetery is sinking. Digging graves in the soggy ground was just making it worse. Tribal administrator Roland Andrew guided a reporter through the cemetery. The white crosses stick out of the sunken ground at odd angles, some of them almost completely submerged in the brackish water. "After we dug down 6 feet, it created a lake around it," Andrew said. The swamp appeared about 10 or 15 years ago and then expanded, swallowing the graves around it. 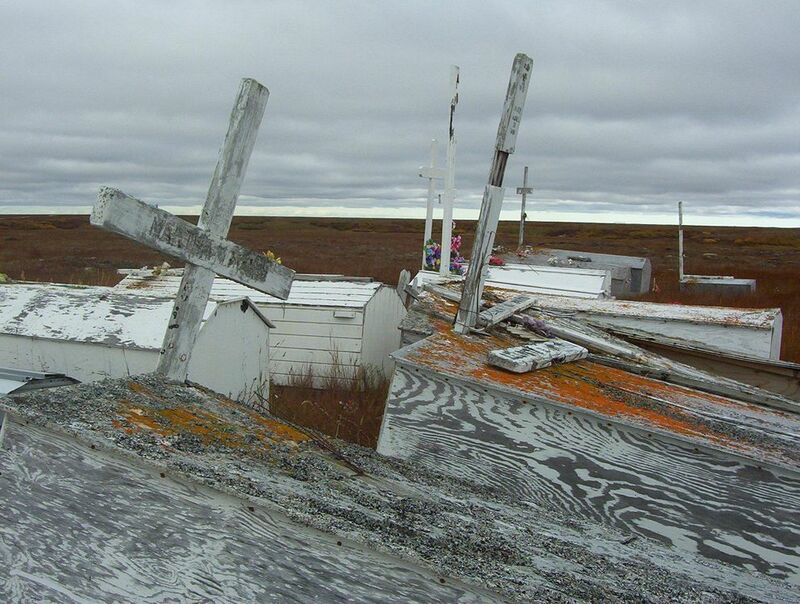 The graveyard in the neighboring village of Kwigillingok, or Kwig, is also sinking into swampland. After consulting with Kwig's elders for advice, Andrew said, Kong started laying its loved ones to rest in boxes above ground. Digging into the ground removes the plants and topsoil that insulate the permafrost and accelerates the rising water. Andrew said that the swamp stopped expanding when Kong stopped burying its dead, but a row of white grave boxes from about a decade ago are teetering at odd angles, sliding feet-first into the lake. The water is still causing problems. Back in town, Otto's family hosted her funeral feast in an old high school gym. Community members piled their bowls high with seal stew and akutaq while children wrestled each other by the bleachers. Otto's daughter, Betty Phillip, sat quietly in a corner. Her mother was laid to rest on higher ground, but not all of her family is so lucky. "Her dad and my grandpa," she said. "He's one of them that's under the water." If she wears rubber boots that reach above her knees, Phillip said, she can wade close to his grave, but can't quite touch his cross. Others tell similar stories. One man said that his cousins tried to drain the water from around his grandparents' grave. When they were alive, they held the family together; his cousins didn't have much luck. Another woman, Hannah Jimmy, said that her parents, aunts, uncles, sister and best friend are all in the cemetery, buried together in a single row. They're underwater now. "We're so poor we can't even do nothing about it," she said. Tribal administrator Andrew said that the village is trying to move the sunken graves to higher ground, but doesn't have the money yet. Thawing permafrost, he said, is warping Kong in other ways. The river is eroding the shoreline and Kong itself is sinking. The hill that the village stands on is slowly slipping down to sea level. When asked whether he thought that Kong would ever need to be relocated due to climate change, Andrew was quiet for a moment, then sighed. "This hill used to be high," he said. "And it's still going down." He doesn't see Kong relocating. If anything, he said, Kong's population might double in size in the future. Residents in Kwig are talking about moving because of the seasonal flooding. Andrew wants to be buried next to his parents; he keeps a picture of them above his desk. They died last year within about eight months of each other after being married for over 60 years. Their grave boxes still smell like fresh paint and are wreathed in plastic flowers, propped up on blocks on the cemetery's highest ground, at least for now. This story was republished from KYUK with permission.